The T head of P dock has deeded length of 102ft but because of outside pilings for protection and tie off, access is easiest for boats of 85 feet or less. Excellent protection and nice view from slip in secure Longboat Key Club environs. Will also rent weekly at $500/wk. 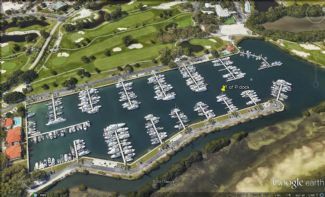 Depth at dock is 18 feet minimum but approach depth to marina is limited to about 8 feet on a high tide. No height restrictions. Convenient close parking spot and bike racks. Free Wi-Fi. Walking distance to Publix, CVS and public tennis courts. In slip pump-out. Dual 30 and 50 amp AC pedestal with individual metering. Annual Lease available. Also for sale $385k. Monthly Rate: $1,300 Mostly listings charge by "Flat Rate" per month.